Originally gaining popularity in northern Europe, Nordic Pole Walking has become a trendy new form of exercise here in North America because of the many health benefits it boasts along with its low exertion rate. It combines the best of both worlds, as it offers more health benefits than basic walking while still being just as accessible to any age or physical level. It is a particularly great form of exercise for any health conscious senior who still wants to remain healthy and active but perhaps can’t take the heavy exertion of more demanding activities. It is also a great excuse to get outside and explore your neighborhood while strengthening your body and improving your quality of life. The extra appealing aspect to this activity, according to Kristen Lemn, a certified Nordic walking instructor, is that Nordic Pole Walking has very little risk associated with it. So you can feel assured that you are not only doing something great for your overall health but you are also not putting yourself at undue risk of injury, making it the perfect choice for any senior looking for a great form of exercise. Contrary to popular belief, Nordic Pole Walking isn’t just walking with ski poles. In fact, according to Cathy McNorgan, a physiotherapist and certified instructor, proper equipment is the key and one should not be tempted to use skiing or hiking poles instead. The purpose of the poles is to offload your lower extremities and make the upper body work harder, causing your entire workout to be more vigorous and ultimately more rewarding. As compared with regular walking, Nordic walking increases one’s heart rate, strengthens one’s core and improves one’s posture while burning 20% more calories. What is truly fascinating is that, according to a study done by the Cooper Institute in 2002, the perceived rate of exertion between Nordic Pole Walking and regular walking remains the same even though Nordic walkers are receiving a more intensive workout. This gives Nordic walking a definite edge over its traditional counterpart. As Gail Dechman, an assistant professor in the School of Physiotherapy at Dalhousie University, puts it, “If people can elevate their heart rate without feeling like they’re working harder, that’s fantastic” (Nordic Pole Walking: Fit or Fad?). 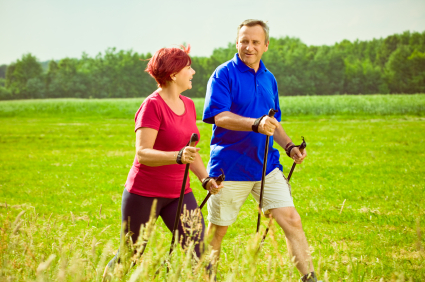 While Nordic Pole Walking is definitely an excellent form of exercise for anyone, especially seniors, it has the additional benefit of being particularly accessible and beneficial for people with chronic health issues. Nordic Pole Walking is great for patients with type 2 diabetes, arthritis, congestive heart failure, chronic hip or knee pain, multiple sclerosis and Parkinson’s disease. This is because the poles not only take stress off the lower body but they also provide support for people who may have balance issues, reducing one’s fall risk. Because of these benefits, Nordic Pole Walking can improve the quality of life for patients with chronic illnesses or disabilities. For example Bill Trewin, an avid runner until he was diagnosed with Parkinson’s disease at the age of 57, found that the poles improved his balance and decreased the intensity of his tremors post-exercise, allowing him to maintain a healthy, active lifestyle. He has since “Nordic walked 23 half marathons and one marathon” (Nordic Pole Walking: Fit or Fad? ), an amazing feat made possible through the use of Nordic poles. The accessibility of Nordic Pole Walking coupled with its many health benefits makes it the perfect activity for anyone looking to lead a healthier and more active life style. It is truly accessible and rewarding for all, whether you are in perfect health (lucky you!) or facing challenges associated with aging. As Suzanne Nottingham, co-author of Nordic Walking for Total Fitness, very astutely puts it, “The potential to improve your health and fitness is right in the palm of your hands. You can start today and do it for the rest of your life” (Nordic Pole Walking: Fit or Fad?). Nordic Pole Walking can truly transform your quality of life, improving your health while getting outdoors and having fun!